A Reuters news article that was written by Anthony Boadle and published on March 28 has reported that Dr. Virginia Soares de Souza has been charged with 7 counts of murder and may have killed 300 patients in order to "free-up" beds. (Doesn't that sound familiar) It has been suggested that de Souza could be one of the world's worst serial killers. Several years ago I heard a talk in Europe by a Dutch physician who did euthanasia. He referred to the patients who were nearing death, but not dying quickly, as "bed blockers." I was shocked that he was suggesting, so plainly, how euthanasia was solving the problem of the "bed blocker". In case you think that Dr. de Souza is unique, you may remember Dr. Harold Shipman who may have killed around 250 patients in England and was convicted of 15 murders. Then there was Dr. Michael Swango, the American doctor who may have killed 60 patients and more recently there was the Finnish nurse Aino Nykopp-Koski who was convicted of killing 5 patients. The study concerning the role of nurses found that 14 nurses admitted to euthanizing their patient and 2 stated that it was done without the permission of the doctor. It is important to note that the Belgian euthanasia law does not permit nurses to euthanize their patients. Considering the fact that it is only a few doctors do most of the euthanasia deaths. It is likely that the reason the abuse of the euthanasia exists in Belgium and the Netherlands is because a very few doctors are actually masking their euthanasia practise under the guise of compassion, but in reality it is a cover for their enjoyment of the power that euthanasia gives them over life. and an act of murder is whether or not the patient consented. As you notice from the Belgian stats, euthanasia without explicit consent is common. The fact is that the euthanasia law acts as a cover for doctors who take the law in their own hands. Euthanasia acts as a cover for a serial killer because their act goes from reprehensible to respectable. 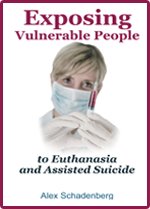 To learn more about the current practice and abuses of the Belgium and Netherlands Euthanasia law, by ordering the book, by Alex Schadenberg ($19.95 includes shipping): Exposing Vulnerable People to Euthanasia and Assisted Suicide. Brazilian Doctor may be linked to 300 deaths. BRASILIA - A Brazilian doctor who was charged with killing seven patients to free up beds at a hospital intensive care unit may have been responsible for as many as 300 deaths, according to a Health Ministry investigator. Prosecutors said Dr. Virginia Soares de Souza and her medical team administered muscle relaxing drugs to patients, then reduced their oxygen supply, causing them to die of asphyxia at the Evangelical Hospital in the southern city of Curitiba. De Souza, a 56-year-old widow, was arrested last month and charged with seven counts of aggravated first degree murder. Three other doctors, three nurses and a physiotherapist who worked under De Souza have also been charged with murder. Prosecutors for the state of Parana said wiretaps of De Souza's phone conversations revealed that her motive was to free up hospital beds for other patients. "I want to clear the intensive care unit. It's making me itch," she said in one recording released to Brazilian media. "Unfortunately, our mission is to be go-betweens on the springboard to the next life," she added in the same phone call. De Souza's lawyer, Elias Mattar Assad, said investigators had misunderstood how an intensive care unit works and she would prove her innocence. More cases are expected to emerge as investigators comb through 1,700 medical records of patients who died in the last seven years at the hospital, where De Souza headed the intensive care unit. "We already have more than 20 cases established, and there are nearly 300 more that we are looking into," the chief investigator assigned by Brazil's Health Ministry, Dr. Mario Lobato, said on Globo TV's Fantastico program on Sunday. If prosecutors prove that De Souza killed 300 patients, this could be one of the world's worst serial killings, rivaling the notorious case of Harold Shipman, the English doctor who was found to have killed at least 215 patients. Lobato said the deaths he reviewed occurred under similar circumstances: a muscle relaxant such as Pancuronium (trademark Pavulon) was administered, increasing the patients' dependence on artificial respiration; then the oxygen supply was reduced, causing death by asphyxia. Some of the patients were conscious moments before they died, he said. Prosecutors said De Souza felt "all powerful" running the intensive care unit homicide, to the point where she "had the power to decree the moment when a victim would die." In some cases, De Souza was absent from the hospital and gave instructions to end the life of a patient by telephone to members of her medical team, according to documents detailing the charges. Last week, a Curitiba judge ordered the release of De Souza and her medical team. Prosecutors sought on Monday to have her returned to custody because she was the leader of the team and witnesses had reported being intimidated. Parana state prosecutors asked police on Wednesday to investigate whether more hospital employees, including former managers, were involved in the case. President Dilma Rousseff's government will announce steps on Thursday to reorganize the hospital, a spokesman for the Health Ministry said.